Established over 21 years ago Square One is a friendly, lively social club primarily for unattached and single people. It is Swindon’s largest club of its type and has over 100 members; there is a roughly equal male/female ratio. 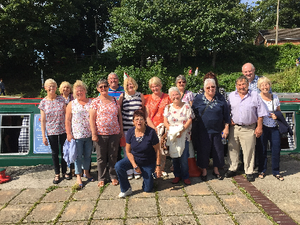 Our members attend events such as skittles, Theatre Trips, Dances, Sunday Lunch, Greyhound Racing, Weekends Away, Holidays, Quiz Nights, Meals Out, Bowling, Walks and Cinema Visits to name but a few. It is suitable for the over 45’s who would like to improve their social life. It is primarily a social club not a dating agency, any relationships which do form being a result of normal social interaction. Couple who meet at the club are able to retain membership. Initial Visits are free, thereafter monthly subscriptions are £3. The club is a non profit making club being run by a voluntary committee and any surplus money is used to subsidise events. Club Night is every Wednesday from 8pm, we have exclusive use of the Function Room of the “Southbrook Inn” in Southbrook Street, Swindon, SN2 1HF and new members are most welcome to attend. Just turn up and ask for a committee member or call 01793 765413 for details. Any late information on events will be here.